Vietnam’s largest airport, Tân Sơn Nhất serves Ho Chi Minh City, formerly known as Saigon, in the south of the country. 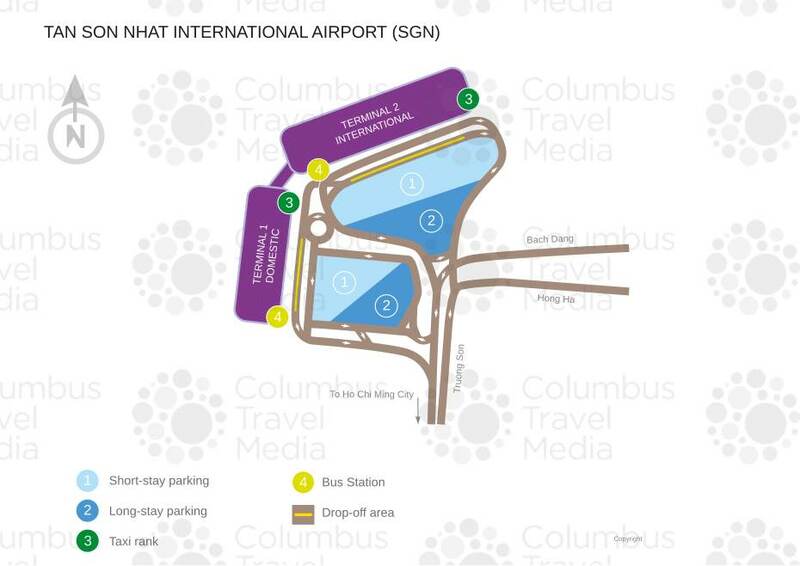 Our Tân Sơn Nhất International Airport guide provides airport contact details as well as information regarding terminal facilities, public transportation options and nearby hotels. The airport is due to be replaced as the country’s main international gateway by 2020 when a new airport, Long Thành, is scheduled to open. However, Tân Sơn Nhất is likely to remain operational, serving mainly domestic flights. There are information desks situated in International Arrivals and outside the Domestic terminal. From the centre of Ho Chi Minh city head northwest along Nam Ky Khoi Nghia road, bearing right on to Truong Son, which leads directly to the airport entrance. The terminals are adjacent to each other; just a short walk separates them. The airport is located within the Ho Chi Minh city limits, about 8km (5 miles) north of the central business district. Bus: Bus 152 runs from the airport to the city centre, terminating at Ben Thanh Market. The fare is about VND5,000, but an additional charge is made for large items of luggage. Some hotels will arrange pick-ups from the airport for a fee. Taxi: Beware of touts and unofficial taxis. It is generally recommended to use cabs operated by Mai Linh (www.mailinh.vn– Vietnamese only) or Vinasun (www.vinasuntaxi.com), but bear in mind that English is unlikely to be understood by the driver. Journey time into the central area is 20 to 30 minutes depending on traffic, and the fare starts at about VND180,000-200,000. There is a Mai Linh taxi desk inside the terminal’s Arrivals area. ATM service and bureaux de change are available. There is a range of food stalls, cafés and restaurants in public areas serving a plethora of Vietnamese and international food and drink. Choices are more limited after security. There is a range of shops offering all types of goods from electronic items to duty-free, as well as the expected souvenir shops. A left luggage facility is available in Arrivals in the International Terminal. A lost and found service is operational in the airport, and is contactable via the general airport number (tel: +84 8 3848 5383). There are no meeting facilities in the airport, but these are available at nearby hotels, including the Mövenpick Hotel Saigon (tel: +84 8 3844 9222;www.moevenpick-hotels.com) about 10 minutes’ drive away. Public telephones are provided, but internet access is only available in the business lounge and in one or two cafés after security. The airport is equipped with escalators between levels, but persons with reduced mobility are advised to contact their airline to arrange assistance prior to travelling. Long-term and short-term parking is located immediately opposite the airport entrance. Car rental is available at the airport, but in order to drive in the country a Vietnamese driving licence is required. It is possible, however, to rent a car with a driver provided.